70th anniversary of “Korea’s liberation and the victory in the great Patriotic War in Russia” – references to the defeats of Japan and Nazi Germany in 1945. KCNA said the countries would “develop the bilateral relations on to a new higher stage in various fields, including politics, economy and culture under a mutual agreement”. The Russian foreign ministry said the agreement was designed to elevate ties “in the political, economic, humanitarian and other areas to a new level”. The Kremlin confirmed it had invited North Korea’s leader, Kim Jong-un, to visit Moscow on 9 May to mark the anniversary of the end of the second word war in Europe. The trip would be Kim’s first outside North Korea since he became leader of regime following the death of his father, Kim Jong-il, in late 2011. The older Kim visited Russia in August 2011 in his armoured train for a meeting with then Russian president, Dmitry Medvedev. The friendship agreement was announced on the same day that officials in Berlin said the German chancellor, Angela Merkel, would not attend the ceremony in Moscow – a snub believed to be in retaliation for Russia’s annexation of Crimea and its support for separatists in Ukraine. The leaders in Moscow and Pyongyang appear to have much in the way of common cause. The UN has targeted North Korea with sanctions since it tested its first nuclear weapon in 2006, and is applying pressure on the Kremlin to end its military involvement in Ukraine. The shift in North Korea’s diplomatic focus towards Russia has been accelerated by tensions with China, Pyongyang’s traditional ally and aid giver. 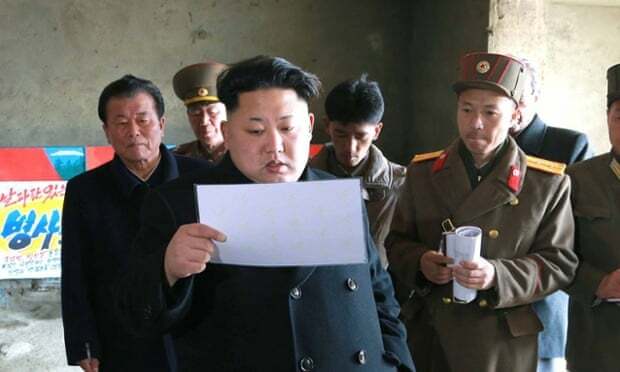 China barely disguised its irritation with Kim after he ordered North Korea’s third nuclear test in 2013 and the execution later that year of his uncle, Jang Song-thaek, who had been instrumental in forging closer co-operation with Beijing. Chinese President Xi Jinping has yet to meet Kim; significantly, though, he has met South Korea’s president, Park Geun-hye, several times. In an apparent attempt to counter Russian influence, China has approved increased co-operation with North Korea along their border and indicated it would be willing to hold a bilateral summit. Xi and Kim could also find themselves face to face at the war commemorations in May. Putin would doubtless welcome the international opprobrium that would follow a public appearance alongside Kim in Moscow this spring. North Korea, meanwhile, stands to gain financially and militarily from closer ties with Russia. In 2014 Moscow cancelled almost US$10bn, or 90%, of North Korea’s bilateral debt and said it would invest the remaining $1.09bn – to be paid back over 20 years – in infrastructure projects such as a cross-border gas pipeline between Russia and the North, and a rail link to South Korea. Russia has also offered to invest $25bn in North Korea’s creaking rail network in return for access to mineral resources. It remains to be seen how a closer the Putin-Kim relationship will affect international attempts to end the North’s nuclear weapons programme. Talks involving North Korea, Russia, the US, China, South Korea and Japan to reach a nuclear deal have been stalled since 2009. North Korea is believed to possess between 10 and 16 nuclear weapons developed using plutonium or weapons-grade uranium. A recent report by US researchers warned that Pyongyang was poised to expand its nuclear programme over the next five years. A worst-case scenario would see it armed with as many as 100 nuclear weapons by end of the decade, the report said.